Amsterdam Airport Schiphol is a very modern airport. One of Europe’s main hub airports, over the years Amsterdam Airport Schiphol has grown into Europe’s Preferred Airport, with direct connections to destinations all over the world. These scheduled services fly from at least 160 destinations within Europe and from 140 non-European destinations. As many as 106 airlines fly to Schiphol, conveniently located in the heart of western Europe. Moreover, Amsterdam Airport-Schiphol enjoys a very special status among its users, ranking first among the world’s airports in virtually every poll conducted among frequent international travellers. 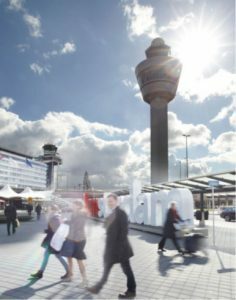 It is Schiphol Airport’s ambition to continue to develop Schiphol into Europe’s Preferred Airport: the airport of choice for travellers, airlines and logistic service providers alike. In order to serve as and remain Europe’s Preferred Airport, Schiphol fulfils its responsibility for five social themes: sustainable employment, accessibility, climate-friendly aviation, raw materials and residual waste streams, and the local community, noise and air quality. Upon arrival in the Netherlands, travellers immediately experience the first sigh of Dutch hospitality, i.a. : the uncomplicated customs procedure conducted by the friendly and courteous people of the Dutch Customs Service staff. After leaving the baggage reclaim area, you can board a train carrying you directly to the city centre within 15 minutes. In most cases a valid passport is sufficient for travelling to the Netherlands. In some cases you will need to apply for a visa. The local Dutch embassy or consulate will be able to inform you with the up to date information on this subject. Nederlandse Spoorwegen (NS) is the Dutch national railway company, which transports nearly a million travellers each day over the busiest railway network of the world. While the NS grid covers all corners of the Netherlands, NS Hispeed operates daily international routes in collaboration with several high-speed European networks, including Thalys, ICE, TGV, CityNightLine and Eurostar. Between them, they serve dozens of destinations on a daily basis. GVB is the public transport company of Amsterdam and offers many direct tram, metro and bus connections from the city centre to Amsterdam RAI. GVB day or multiple day tickets entitle your participants to unlimited travel through Amsterdam, day and night, by tram, bus and metro. In 2020 the new metro line (the North South line) will run directly from the north and south parts of Amsterdam to the city centre making the city even more accessible. The compactness of the city minimizes the need for taxis and public transport, as almost everything is within walking distance. Nevertheless, public transport on Amsterdam’s trams, buses and metro is most efficient, very modern, reliable and inexpensive. Optionally public transport tickets can be included in the entrance fee, enable delegates to travel freely on the Amsterdam’s municipal transport system during the congress. Naturally bus shuttle services can be provided as well.